Our kids are fairly good about eating soup (Nora specifically likes it a lot) and Dave and I both enjoy the ease of warming up a bowl of soup as leftovers for lunches throughout the week. Today’s 20-minute recipe is a great way to work a few extra veggies into a meal (just use whatever you have in the fridge that your family will eat)! We often eat this soup as a vegetarian side dish — along with sandwiches, salads, or other main dish meats. The picture below is of our favorite layered salad (with a yogurt dressing) and these delicious baked sandwiches! Of course, as I mention below, you could easily add in cooked ground sausage for a super hearty main-dish meal that would taste amazing with a slice of crusty bread. 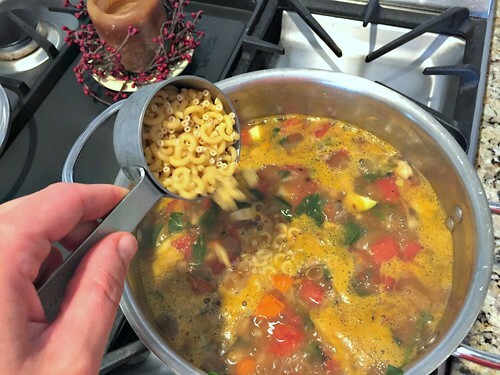 Add in all the rest of the ingredients except the dry noodles. Simmer for 10 minutes, or until veggies are fairly soft. Add in macaroni and simmer for 10 more minutes or until noodles are tender. Refrigerate leftovers and enjoy all week long! 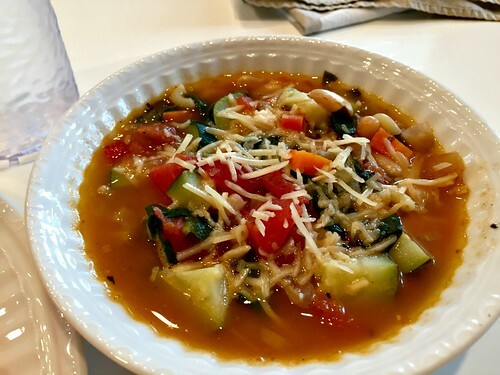 It’s so quick and easy (you don’t want to simmer this soup all day long as the veggies will get too mushy) so it’s perfect for a quick weeknight meal. 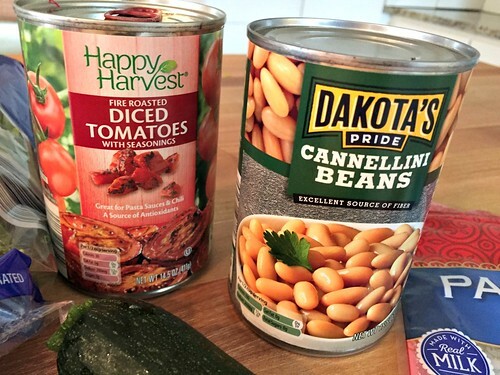 I often make this recipe when I want to ‘clean out’ the vegetable drawer a bit — but the instructions listed above are what tastes best (in my opinion). 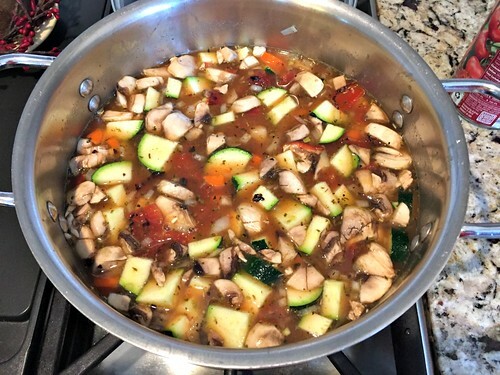 I love the zucchini, carrot, mushroom combo — especially with the Thyme and Oregano. Of course, feel free to mix this up with whatever you have on hand — try different broth, spice, and veggie combos for different flavors. And you can definitely omit the pasta if you want it to be gluten free — just reduce the liquid a bit (maybe 3 cups of broth instead of 4). 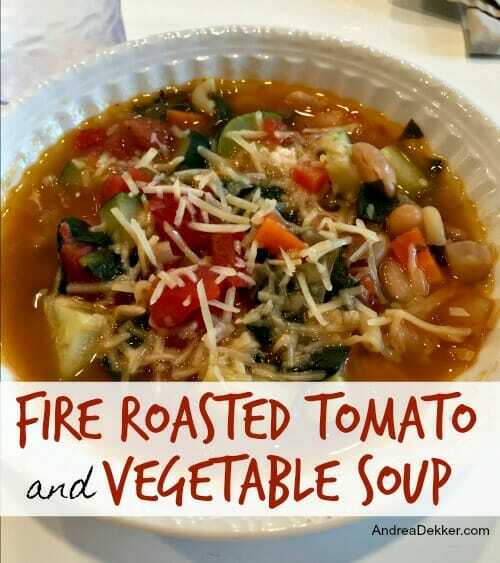 If you’re looking for a yummy soup to serve as a side dish or main dish this spring (and all year long) give this veggie-packed soup a try! 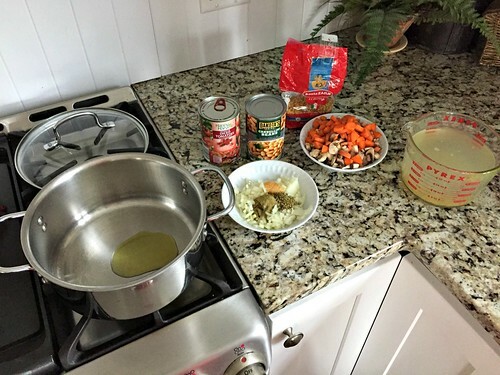 Do you enjoy soup year-round too? What are your favorites? Soup! What a great idea for today! It’s cloudy and cool here, in Portland today and kids are fighting colds! 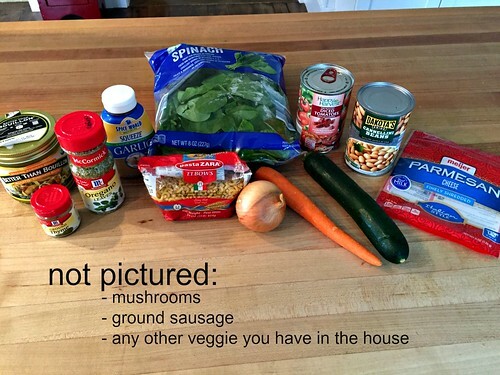 I’ll make this for dinner. Thank you for the idea! Yes, we do have soup year round, (maybe not as often as we should), but we do tent to enjoy them more during winter. One other of our favorite soups is what I call CPC (Corn, Potatoes, Cauliflower). I start with sauteing onions, I add the corn (frozen, and sometime I run it through the food processor to chop in even smaller) and let it simmer while I peel, wash and dice the potatoes. Add them to the boiling pot, adding more water and salt, and let them boil until I prepare the cauliflower. 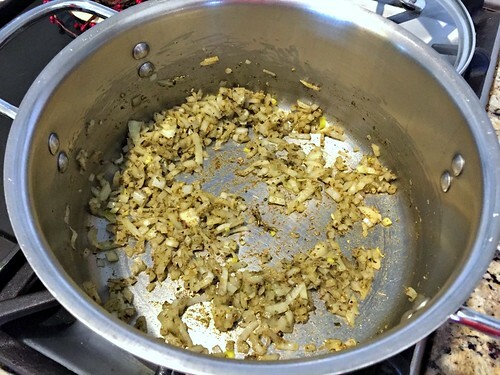 By the time the cauliflower is cleaned and broken or chopped into small chunks, the potatoes are almost done. I add the cauliflower, add more water and salt if needed, maybe pepper and a little hot pepper sauce, wash and dice a little fresh parsley (if I have it) or use dried herbs. By this time all the vegetables are almost cooked, I can clean up the kitchen and Done! It’s that fast.But this one is warming and calming, so it’s best on a winter day. ~Cabbage in tomato soup (finely shredded, plus onions, carrots and dill) – very cooling and you can add a little plain yogurt when serving it, to dress it up and make it even more cooling. It tastes delicious even cold! Thanks for the reminder to add this to my meal plan. 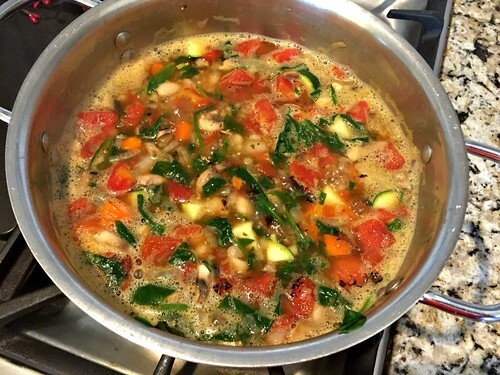 Minestrone! Yum! Good way to clean out little bits of leftovers- I make the same recipe but with celery, cabbage, and green beans, too. Anything works, pretty much. In the summer I use bits and pieces of garden vegetables, leftovers, and fresh herbs. When I know ahead of time that there will be leftovers, I cook the pasta separately and add to each bowl before serving, or before heating up leftovers. Otherwise, the pasta can get pretty yuckky. yeah, the pasta can get really ‘bloated’ in the leftover portion! Good idea to keep it separate! 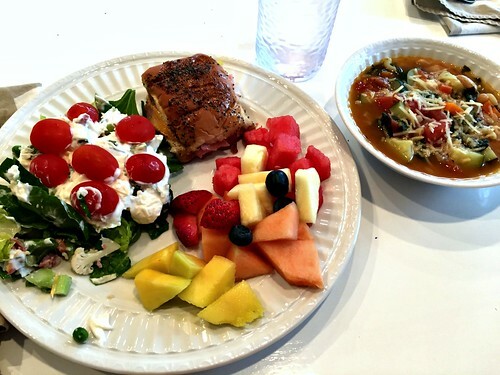 Andrea, soup and salad is always a healthy meal option. I’ll be trying your soup recipe soon. This does sound good. And I too would eat this soup cold on a hot day with a fruit salad and a glass of iced coffee. Yum! I’ve eatten it cold before — definitely still yummy!